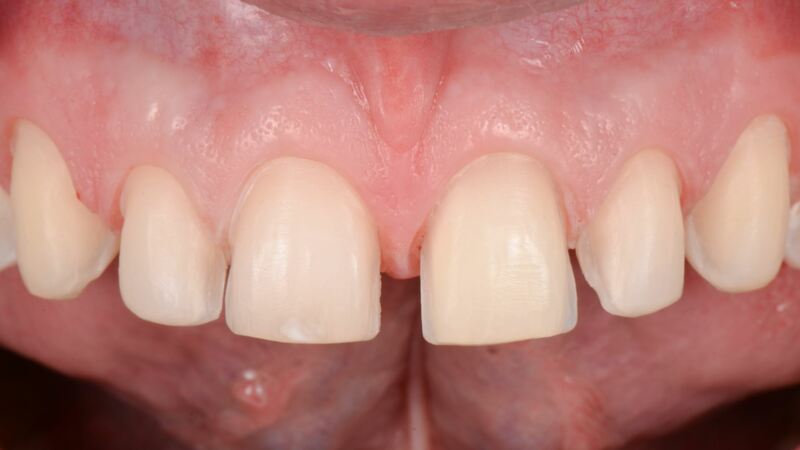 Cases with large diastemas are challenging. 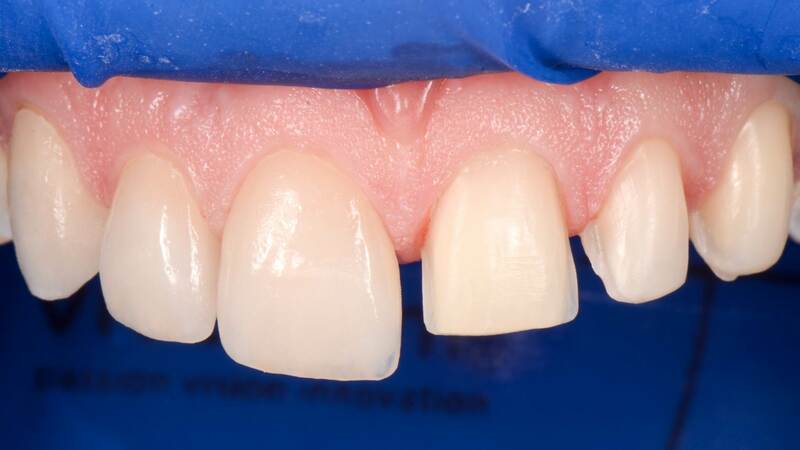 The prosthetic closure of gaps with wider teeth is limited by a length/width ratio of 85%, which is the widest ratio that is still perceived as esthetic for central incisors. 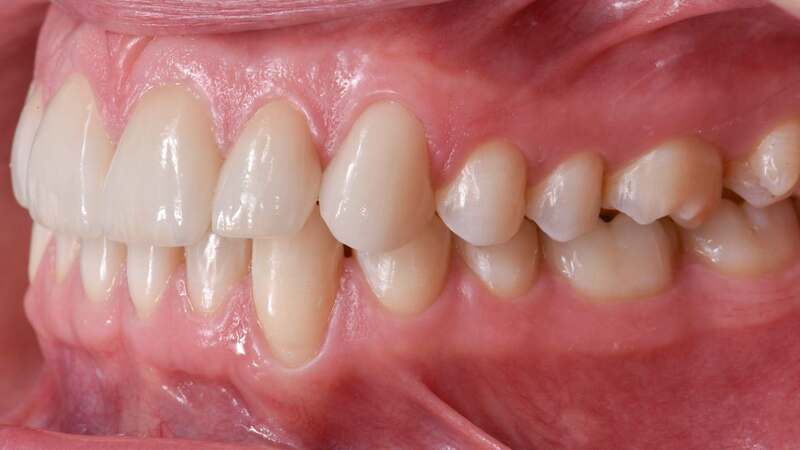 The orthodontic closure of gaps is limited by arch form and patient bite. In these cases, a combined orthodontic and prosthodontic approach is necessary to achieve an esthetic and stable result. Thorough treatment planning in such cases is essential. However, it is also challenging, as orthodontic treatment is never completely predictable. 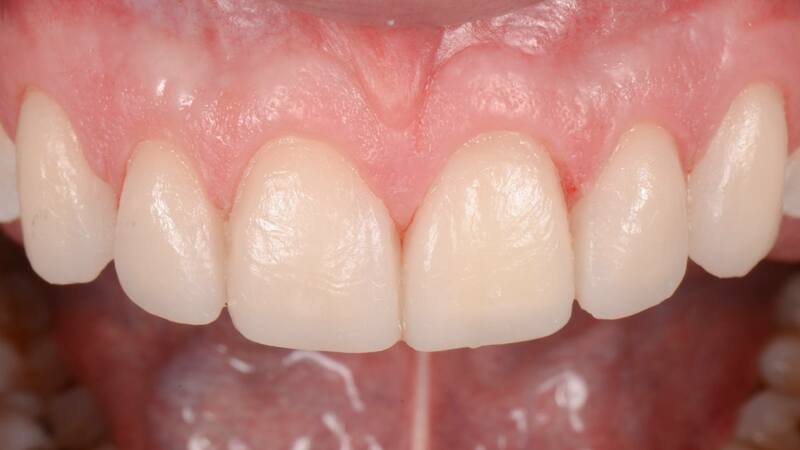 The following case was solved by a combination of orthodontics and prosthodontics, along with tools used to predictably achieve the desired result. This patient's chief complaint was dissatisfaction with their smile's esthetic appearance due to diastemas. Prior to consultation, the patient had visited multiple dentists and orthodontists who said that predictable treatment was not feasible. 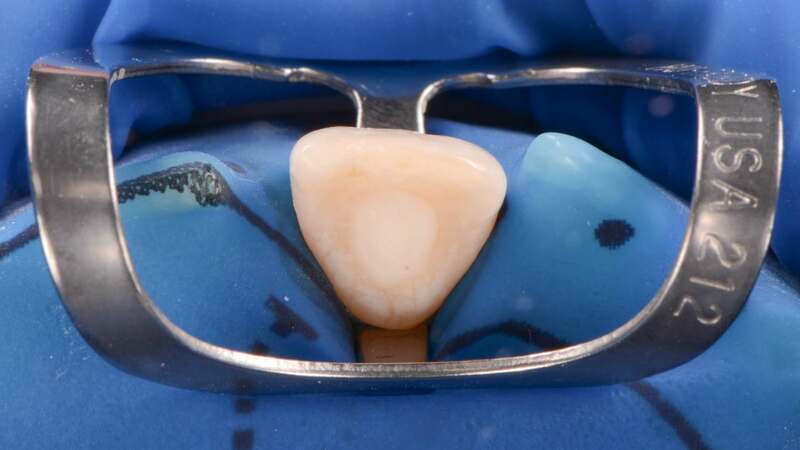 Additionally, tooth #21 (FDI) / #9 (US) was discoloured due to an accident suffered several years earlier. Furthermore, the lower teeth presented diastemas and rotations. Medical history was unremarkable. Treatment procedures were carried out as follows: First, root canal treatment on tooth #21 (FDI)/ #9 (US) (a non-vital tooth) was completed. Additionally, the tooth was internally bleached with 35% hydrogen peroxide during one week. 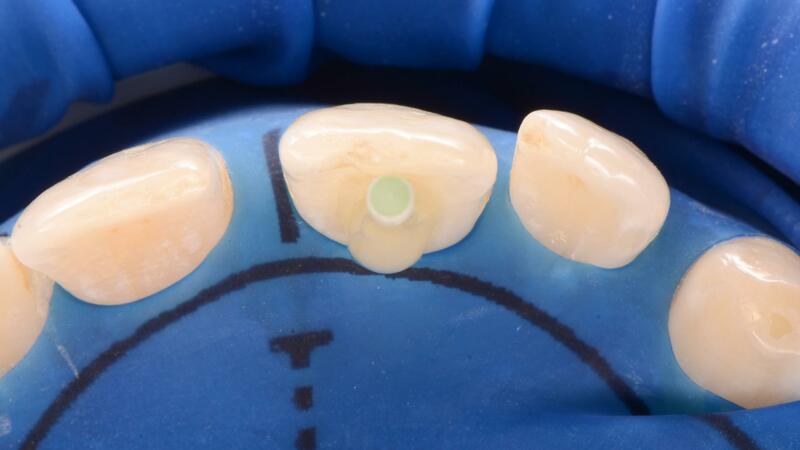 The upper anterior teeth were provisionally widened using composite resin. This simplified the orthodontic treatment as the treatment goal shifted from an even distribution of spaces, which is challenging to achieve, to a simpler closure of the open spaces. Following this provisional restorative treatment, orthodontic treatment was carried out until the desired position of teeth was achieved. 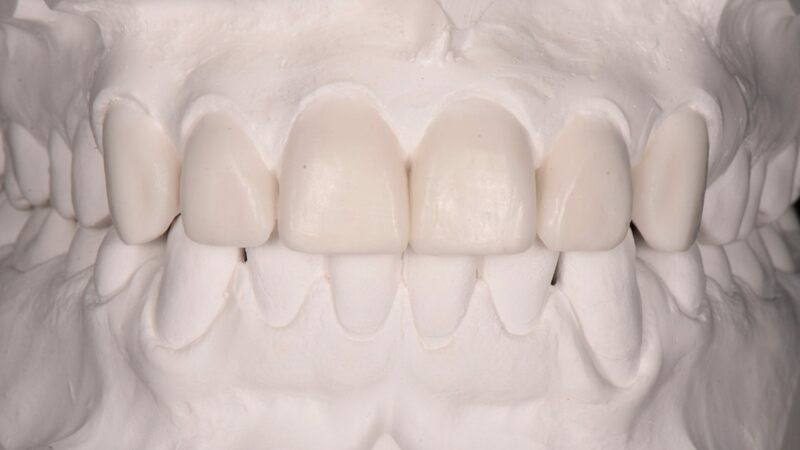 Once all teeth had been aligned, the upper incisors and canines were prepared for porcelain veneers. 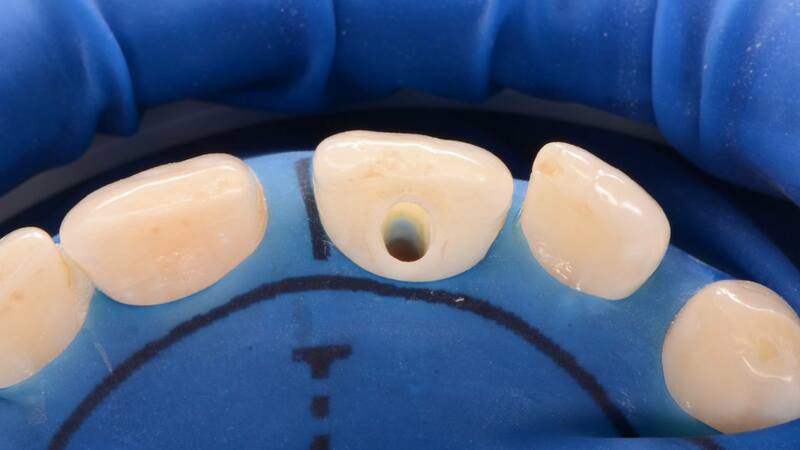 Provisional restorations were fabricated on the same day. 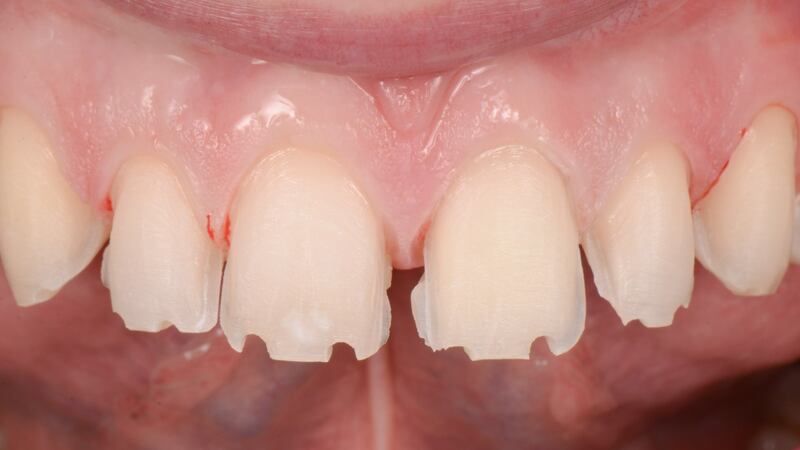 Finally, laminate veneers, constituting the definitive prosthesis, were facbricated and bonded. Initial smile. 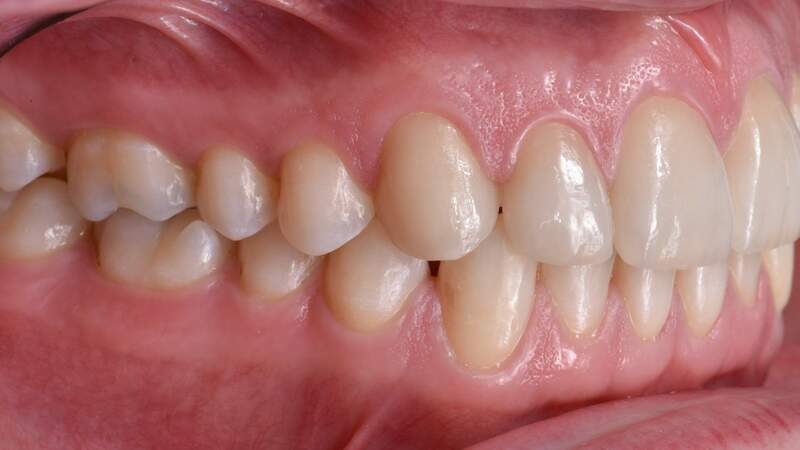 Note the diastemas between the upper front teeth, the discoloration of tooth #21 (FDI) / #9 (US), and the misalignment of the lower front teeth. Initial intraoral frontal view. 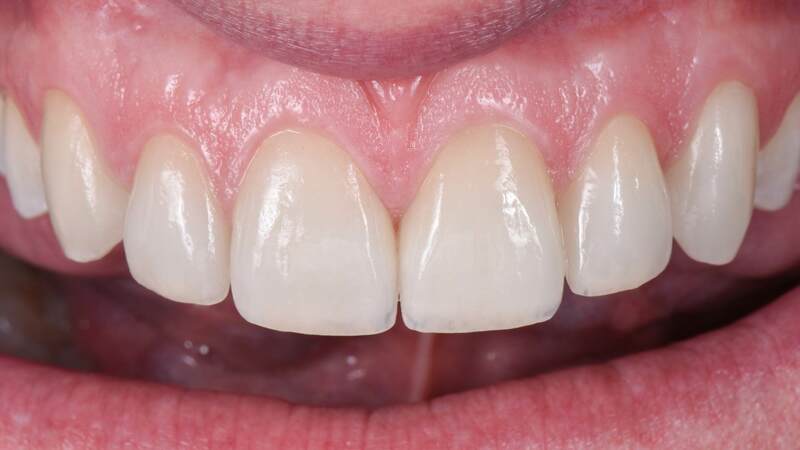 Note the presence of a wide diastema between the upper central incisors and the discoloration of the upper left central incisor. 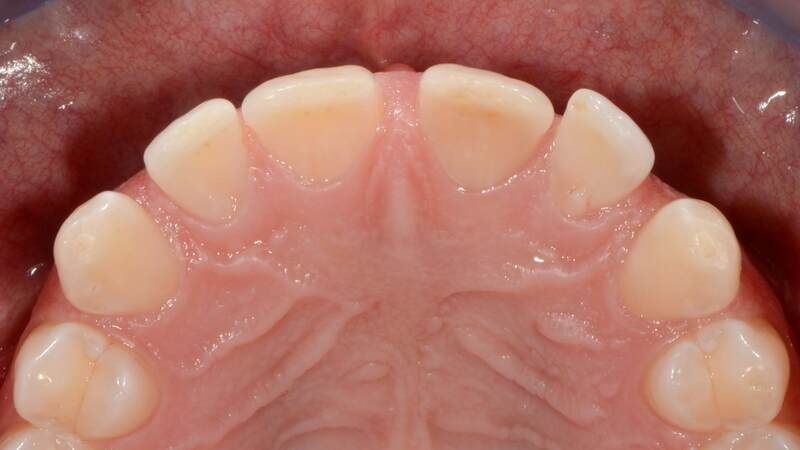 Initial intraoral frontal view. Length/width ratio was planned to be 85%. Note the shift in the midline (about 2,5 mm towards the left). Initial intraoral frontal view - maxilla. 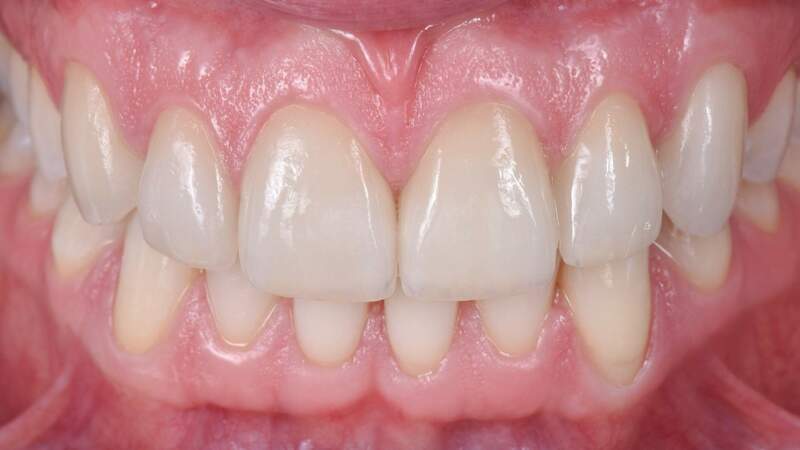 Note the discoloration of the upper left central incisor due to an accident years earlier. Initial intraoral occlusal view - maxilla. Initial intraoral frontal view - mandible. Initial intraoral occlusal view - mandible. Panoramic radiograph previous to treatment. 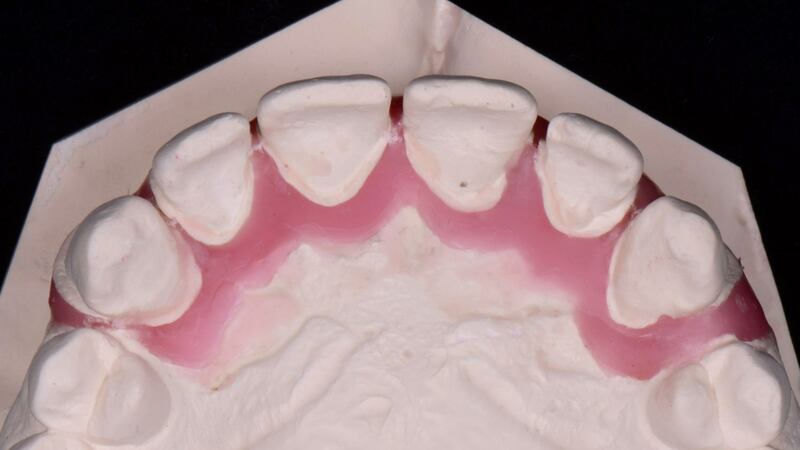 Study models were taken in order to treatment plan for a prosthetic-orthodontic combined approach. 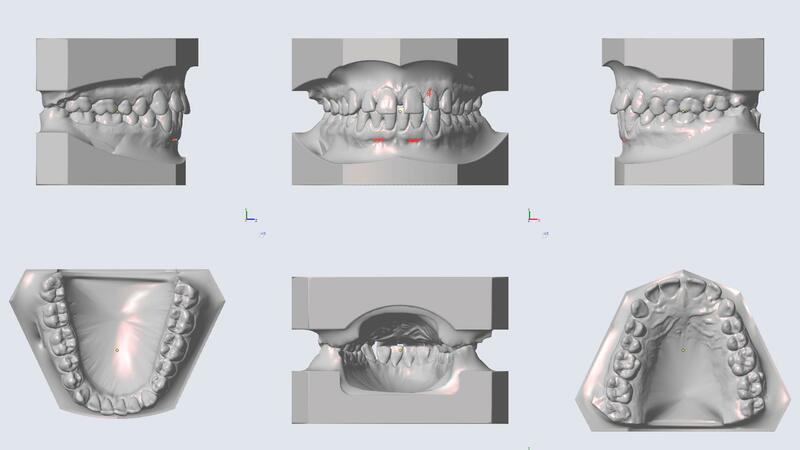 Study models were digitized in order to treatment plan for a combined orthodontic-prosthodontic approach. 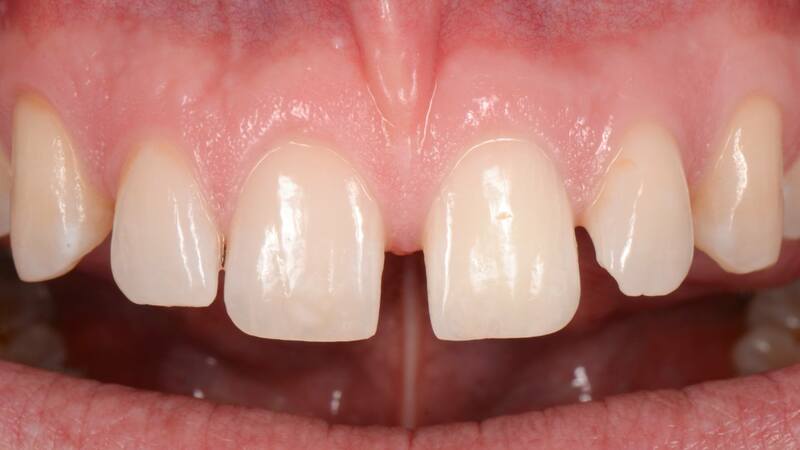 Diagnostic wax-up with the ideal shape and position of the upper front teeth. 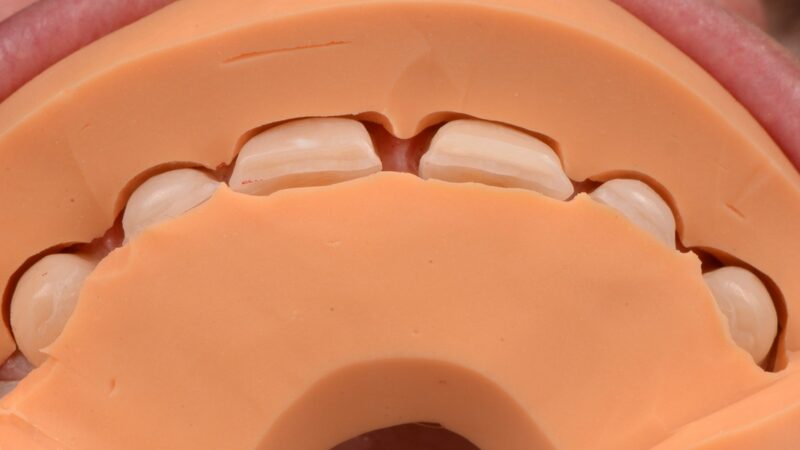 Wax-up models can assist in communicating the approximate final result to the patient previous to treatment. 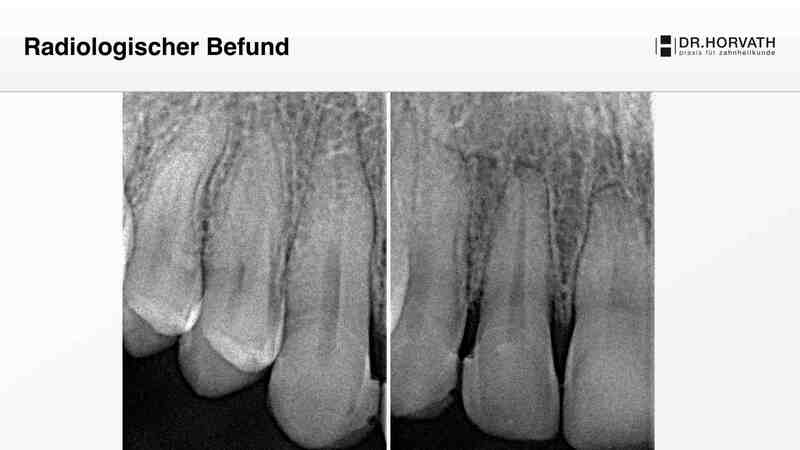 Root canal treatment of tooth #21 (FDI) / #9 (US) was carried out due to pulp necrosis. 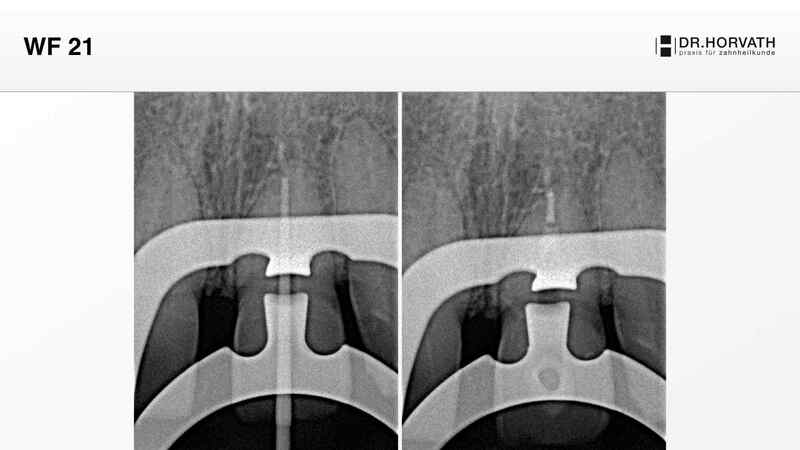 A periapical x-ray was taken to confirm working length. 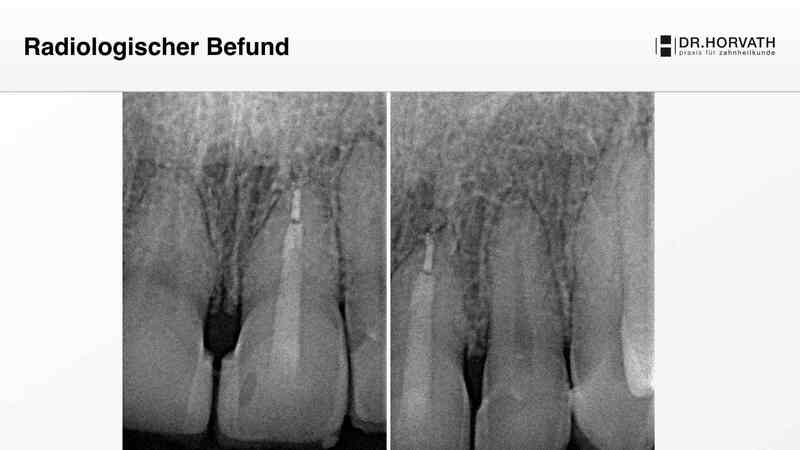 The root canal was sealed in order to prevent the apical migration of bleaching material. 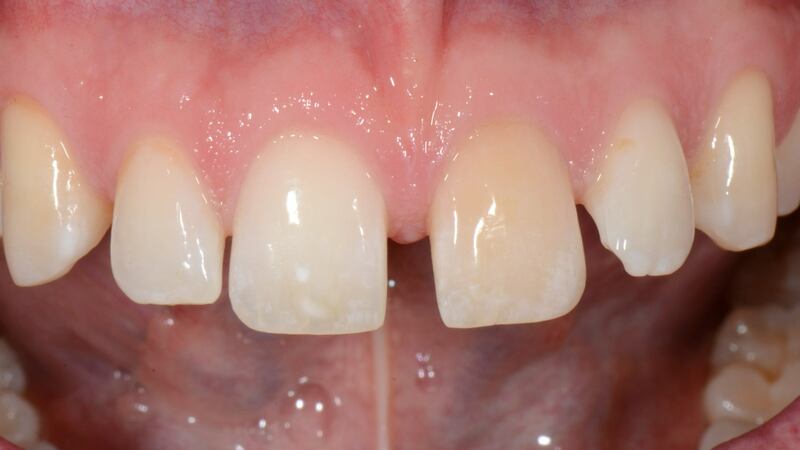 Photograph taken to document tooth shade previous to internal bleaching. 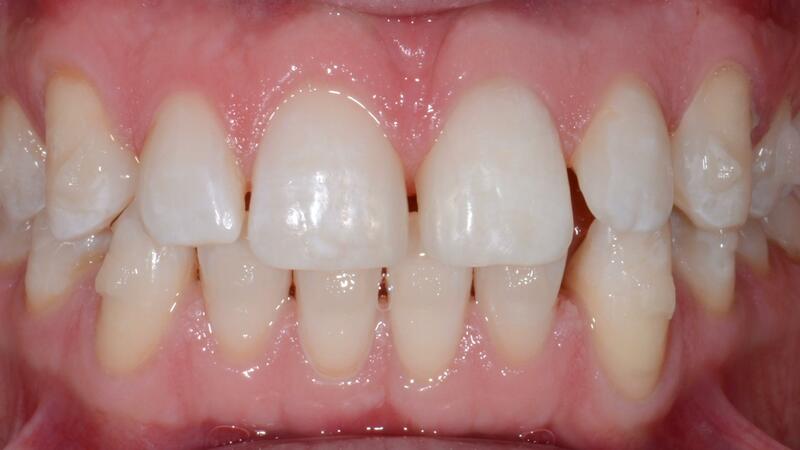 Root canal was once again accesed to carry out an internal bleaching procedure. 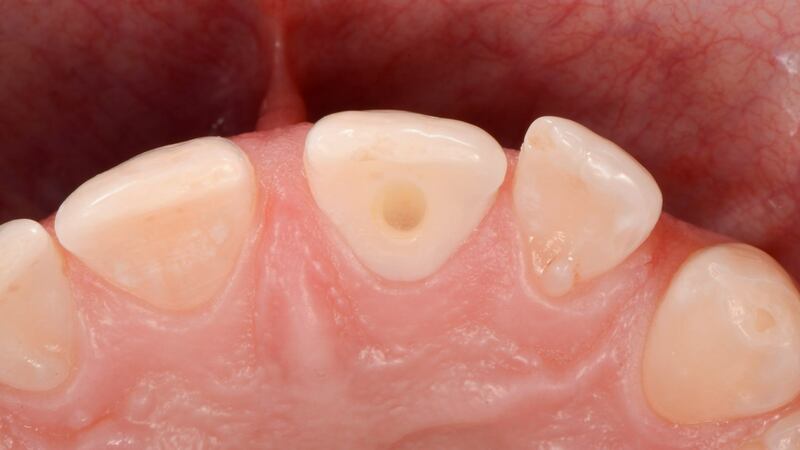 The access cavity was designed to preserve as much tooth structure as possible. 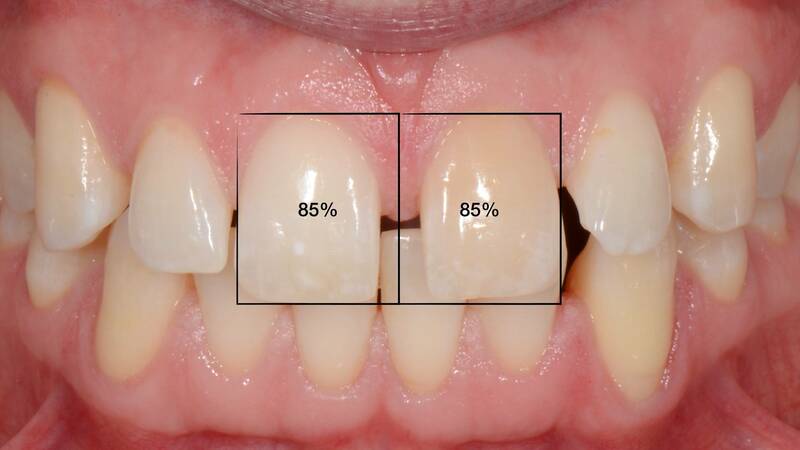 35% hydrogen peroxide was applied to bleach the tooth internally. 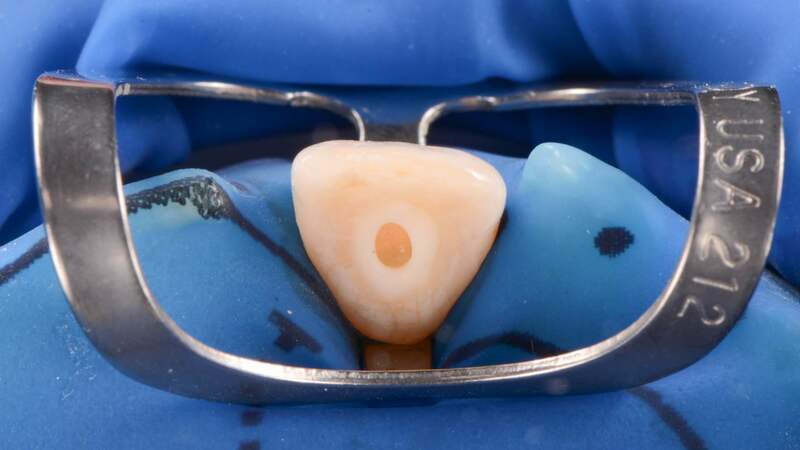 The tooth was provisionally sealed with composite resin. After one week of internal bleaching, the result was examined. The shade on tooth #21 (FDI)/ #9 (US) had greatly improved. Second stage root canal treatment. 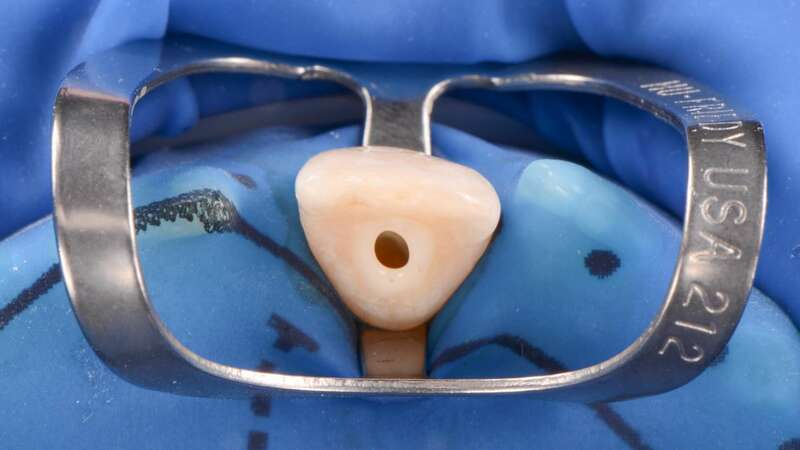 Access cavity after removal of the provisional restoration. A fiber glass post was inserted, leaving around 4-mm of gutta-percha apical to the post to ensure apical sealing. Occlusal view after completion of the root canal treatment. 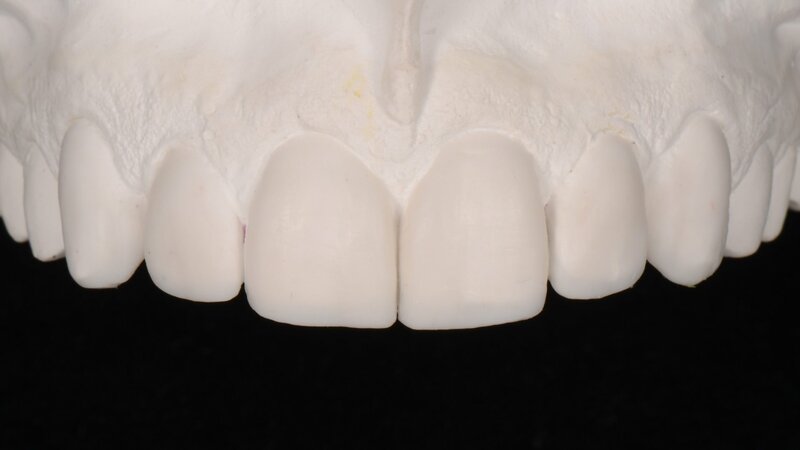 A silicone index was used to transfer the width of the final restorations simulated in the wax-up. 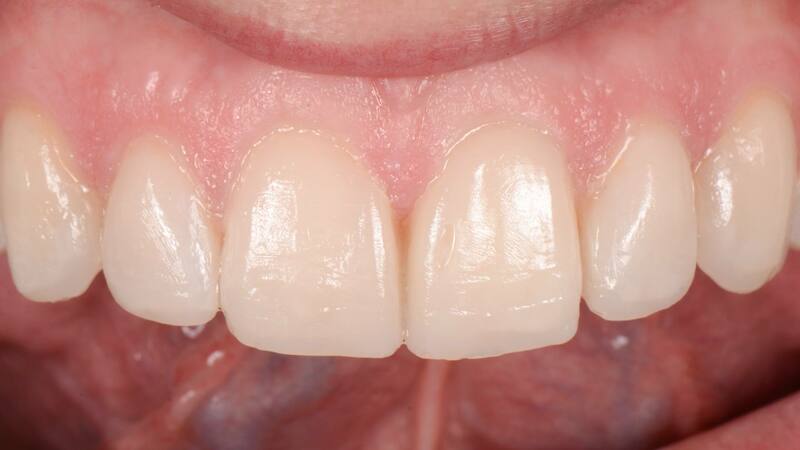 The upper anterior teeth were provisionally widened with composite resin restorations. 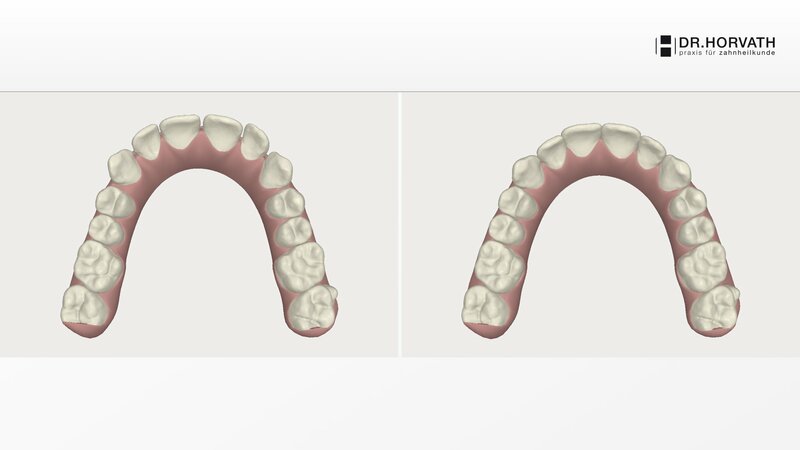 This simplified the orthodontic treatment, as the treatment goal shifted from an even distribution of spaces, which is challenging to achieve, to a narrower closure of open spaces. 3-D virtual treatment plan simulation - frontal view. 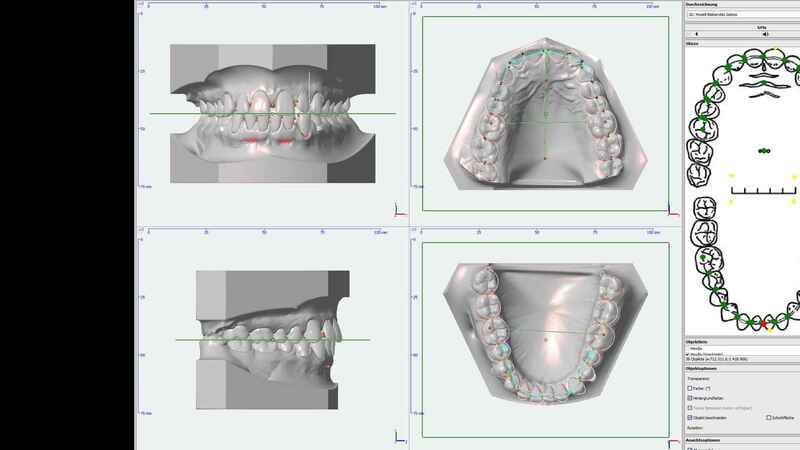 3-D virtual treatment plan simulation - occlusal view. Intraoral frontal view after removal of orthodontic appliances. 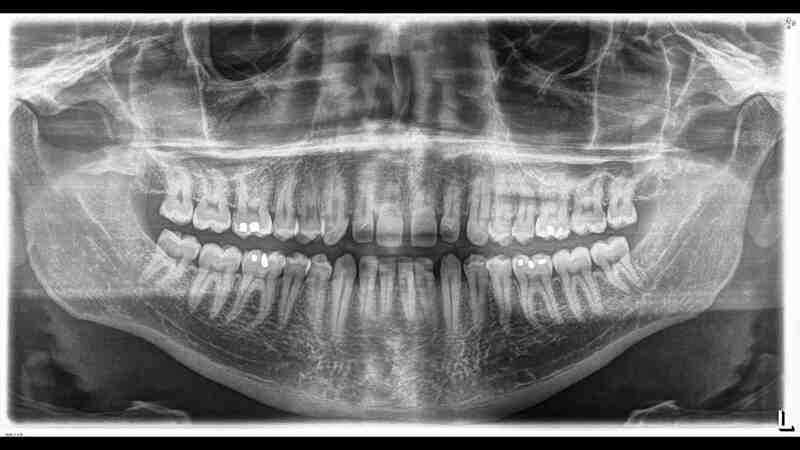 Periapical radiographs after removal of orthodontic appliances. 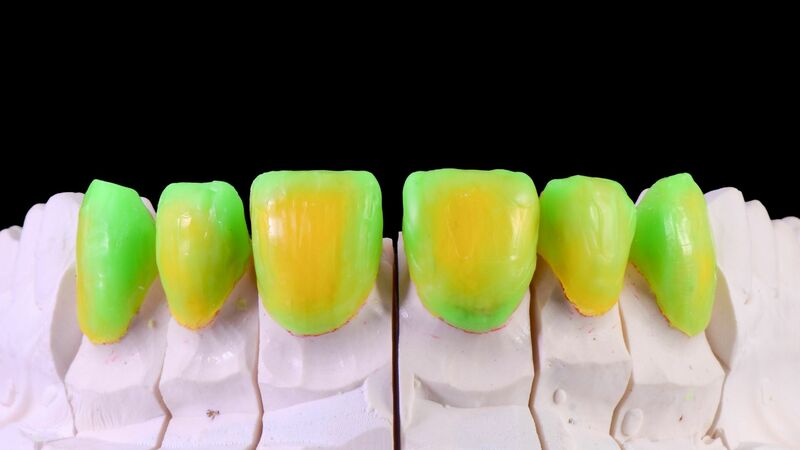 Diagnostic wax-up previous to teeth preparation for laminate veneers. Silicon impression key according to wax-up. Silicon key according to wax-up. Tooth mock-up according to previously elaborated wax-up. Tooth preparation over the mock-up. 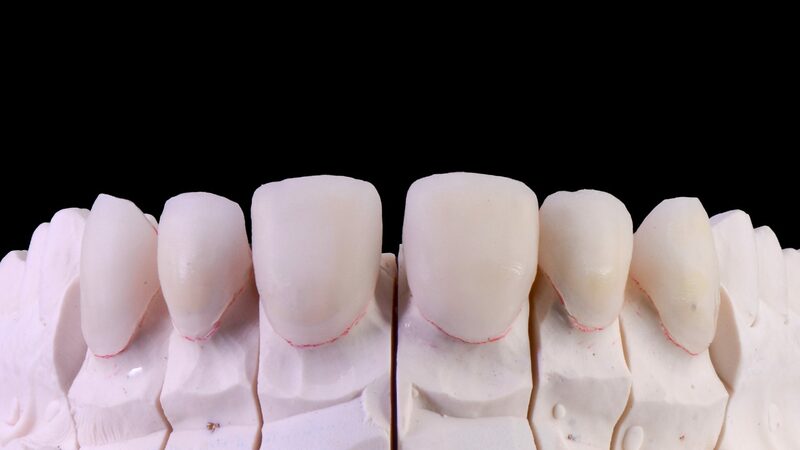 Teeth were prepared for porcelain veneers. The silicone key was filled with self-curing acrylic for the fabrication of temporary restorations. Excess material outside the key was removed. 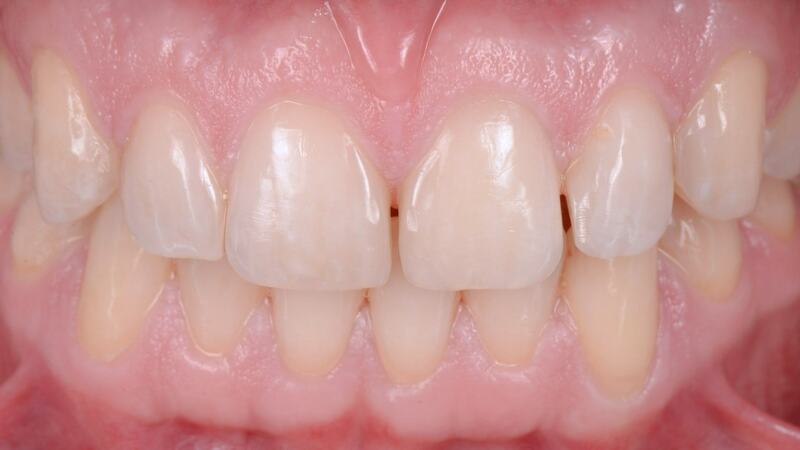 Patient smile with provisional veneers. Fabrication of laminate veneers. Pre-sintered laminate core. Fabrication of laminate veneers. Sintered laminate core. Fabrication of laminate veneers. Sintered full contour. Fabrication of laminate veneers. Final stain and glaze. 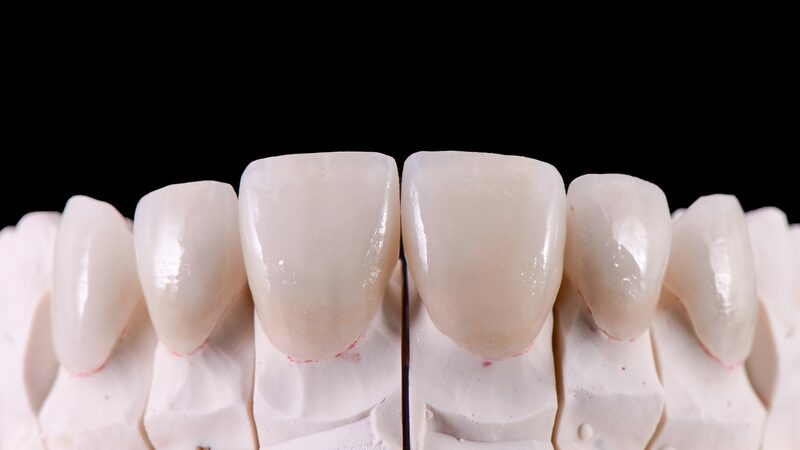 Adhesive bonding of final veneers. 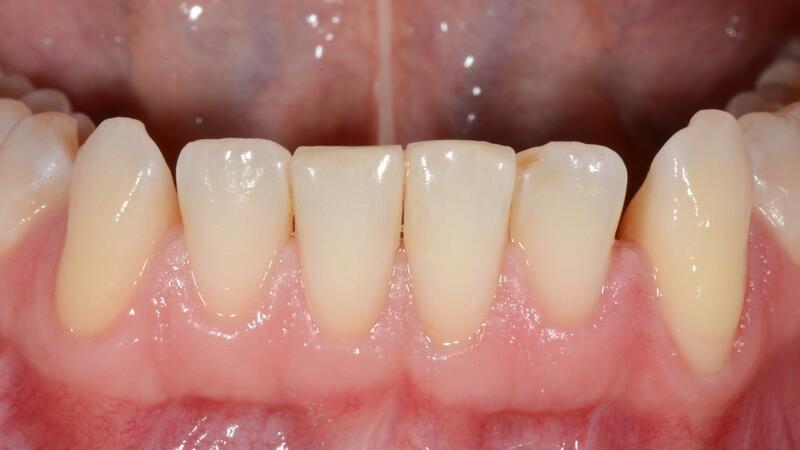 Frontal view after veneer bonding. 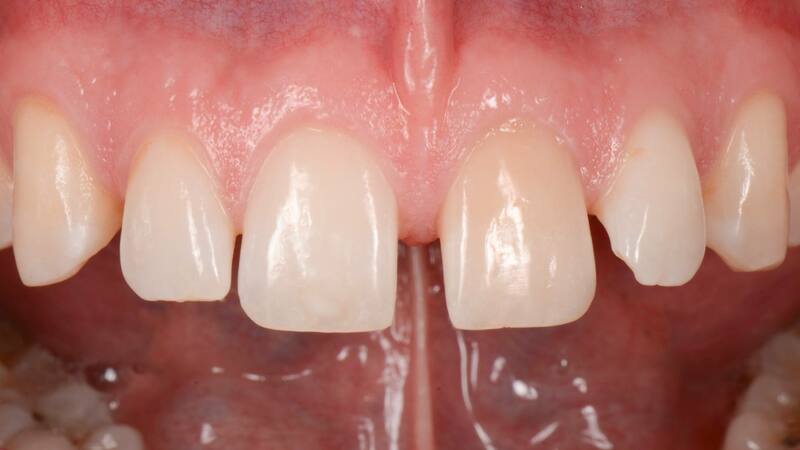 Intraoral view after veneer bonding - maxilla. 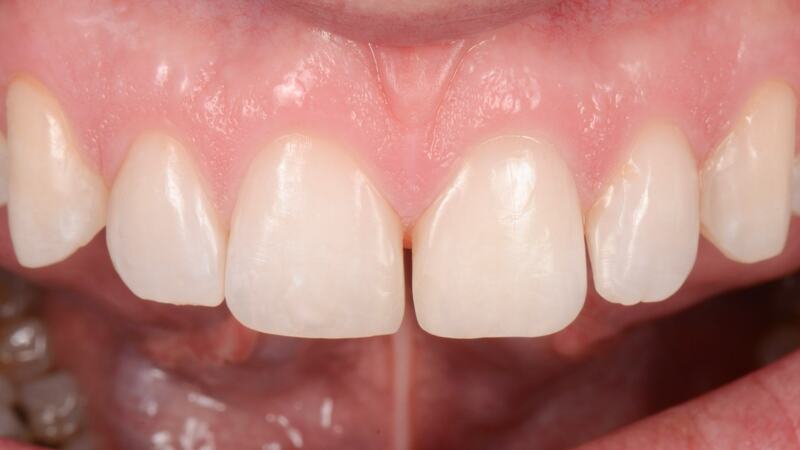 Intraoral lateral view after veneer bonding - right side. 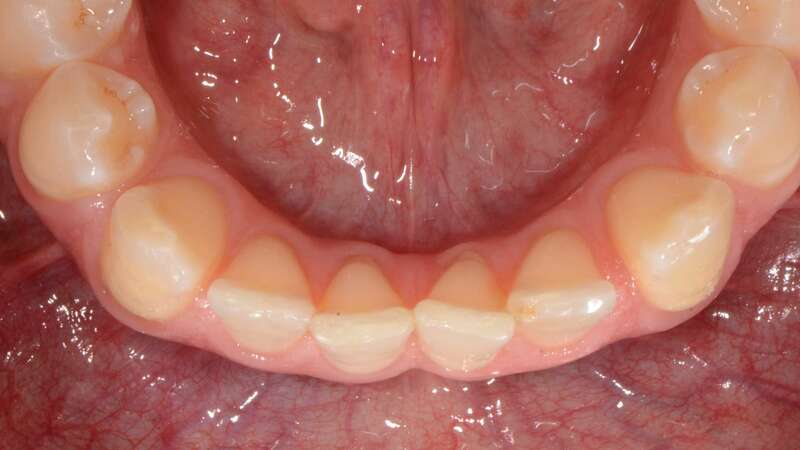 Intraoral lateral view after veneer bonding - left side. 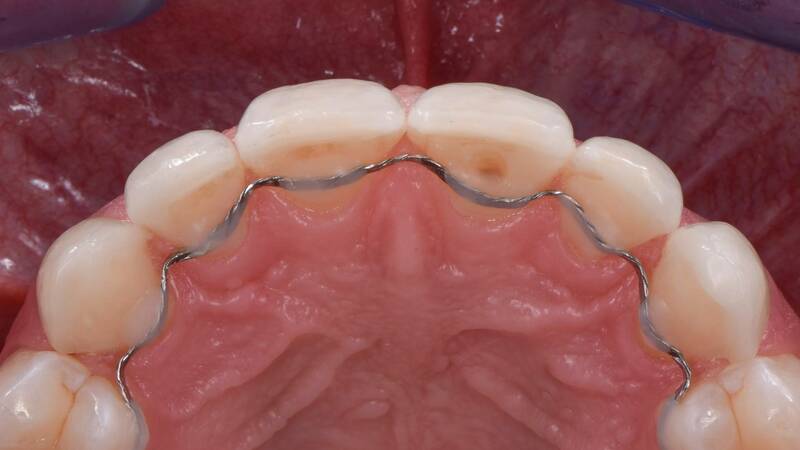 A palatally-bonded wire was installed as a retainer. Patient smile upon treatment completion. 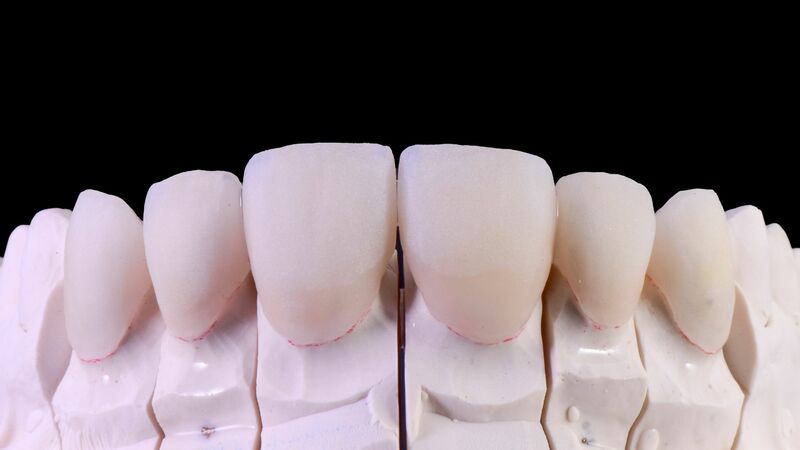 Gurel G1, Morimoto S, Calamita MA, Coachman C, Sesma N. Clinical performance of porcelain laminate veneers: outcomes of the aesthetic pre-evaluative temporary (APT) technique. Int J Periodontics Restorative Dent. 2012 Dec;32(6):625-35. Gurel G1, Sesma N, Calamita MA, Coachman C, Morimoto S.Influence of enamel preservation on failure rates of porcelain laminate veneers. Int J Periodontics Restorative Dent. 2013 Jan-Feb;33(1):31-9. 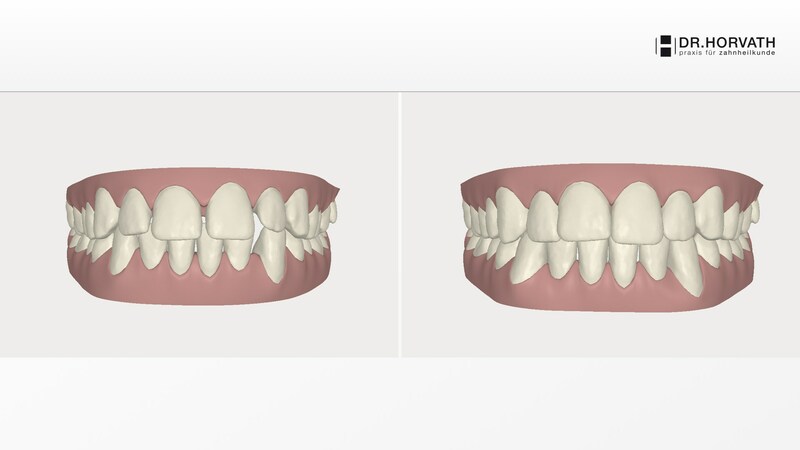 Moon JE, Kim SH, Han JS, Yang JH, Lee JB.Esthetic restoration of maxillary anterior teeth with orthodontic treatment and porcelain laminate veneers: a case report. J Adv Prosthodont. 2010 Jun;2(2):61-3. doi: 10.4047/jap.2010.2.2.61.